Look I get it. No matter how much I whine, the automotive world is becoming the world of the SUV. Roads filled with crossovers, ute’s , and the much maligned minivan. The coupes and sedans of our past are becoming nothing more than memories; remnants of a youth that is long gone. Of course newspapers used to hit the same driveways those types of cars parked on every morning, and we seem to have gotten along just fine without worrying about getting our fingers dirty with newsprint every morning. And I suspect that we will carry on just fine without coupes and sedans. One of the biggest issues I have with the SUV is the size and slowness of most. A decent full-size SUV will take up nearly an entire lane, and while the engines of most are large, that’s primarily due to the fact that they weigh so much. And it means that they are still ungodly slow. Sure, there are a few exceptions, I had a Porsche Cayenne, a Turbo S, a few years ago, and with 550 twin turbo charged horses under the hood it was anything but slow. BMW makes SUVs that aren’t slow; the X4 M40i has 355 horsepower under the hood and is sort of an SUV. There’s a problem with those, however. That X4 sort of SUV costs $67,495 and that Cayenne, well now that will set you back $168,225. 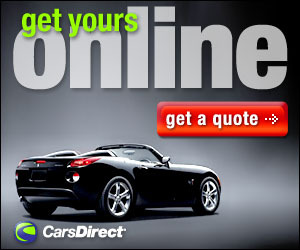 So then it seems that if you want a fast sporty SUV you need to start your own pyramid scheme. And for the record I wouldn’t last more than an hour in jail. Leave it to our friends at Ford to try and come up with a solution. Ford has several SUVs. 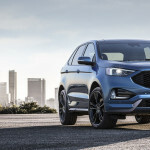 For our discussion we will refer to the Ford Edge, a decent midsized SUV that has sold pretty well for the iconic American brand. 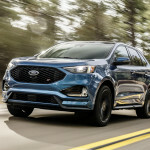 There has been a “Sport” variant of the Edge, but for 2019 they stepped up and rebadged the Edge with the “ST” designation. 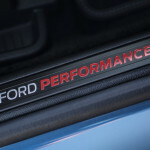 The ST brand is Ford’s performance nameplate, which debuted for the U.S. market on the Focus ST, which is one of the hottest hatchbacks in the world, or at least mine. Someone within Ford then, thought it would be a great idea to put the ST on an SUV. 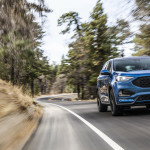 The 2019 Ford Edge is a midsize crossover SUV that can seat five. It’s offered in four trims: SE, SEL, Titanium and ST. The SE is decently equipped, but the SEL offers more amenities and access to options packages. The Titanium is all about luxury, while the ST is the performance model. Ford sent me the new Edge ST for a recent week. 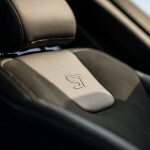 Under the hood the Edge ST has a turbocharged V6 engine that makes 335 hp and 380 pound-feet of torque. 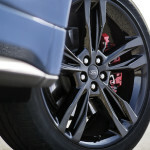 The ST also has standard all-wheel drive and a sportier suspension. On the outside the ST does have some styling differences such as a gloss black grille and matching fog-light surrounds; there are black bezels in the headlights and out back dual-exhaust outlets. My tester had the ST Performance Brake Package and 21-inch Pirelli P Zero summer tires. The red brake calipers gave a nice contrast to the gloss black aluminum wheels. 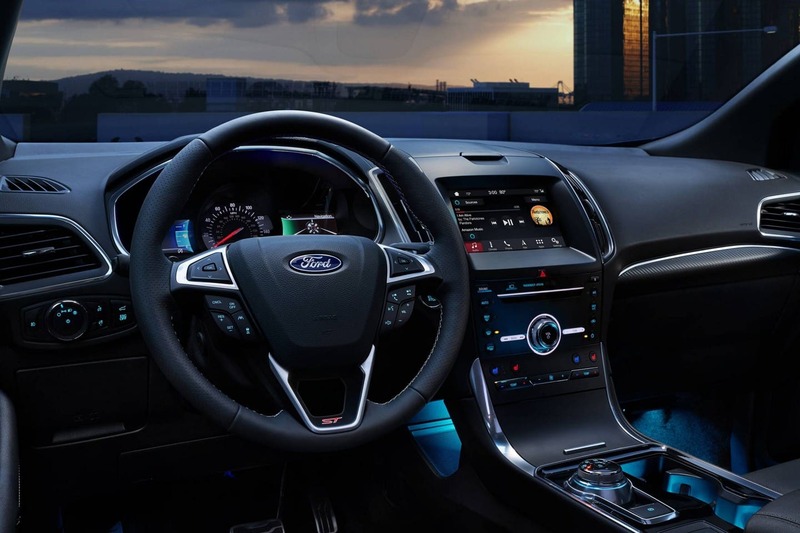 Inside the seats have special ST bolstering, suede-like inserts, and the instrument cluster has an all-digital section missing from the regular Edge. Overall, I liked the look. And hoped the drive would be just as nice. Sadly, I was a bit underwhelmed. Yes, there was more power, and in Sport mode the engine exhaust note did open up, and the sport tuned suspension holds the body roll to a minimum while the 8-speed automatic shifted well; but 0-60 in 6 seconds is a little disappointing. But then this is not the Cayenne, nor the M40i, so we can’t expect that sort of performance. Still… the fun factor I had with those seemed to be missing. 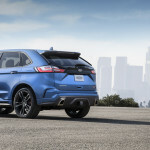 The 2019 Ford Edge ST will set you back about $52,225. That’s about the same as the M40i or a BMW X2 a small sort of crossover that tops out at $50,620. Yes, the X2 is a bit smaller and has less power, but does seem to have that fun factor lacking in the Edge ST. There is a bright spot, however. Twice during my week people in parking lots approached the Edge ST with nearly astonished looks on their faces: “Ford puts out an Edge ST?”. Yes, yes they do. It appears then that this new Edge ST has a fan base; and that’s a good thing. There are no doubt people who are loyal to BMW and Porsche who will get their sporty SUV only from those companies, just like Ford fans with a ‘need for speed’ will flock to the Edge ST and buy it even if it falls a bit short of filling that ‘need for speed’. 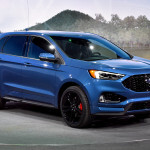 The coupes and sedans may someday be a thing of the past, but it’s nice to know that American automotive companies are trying to put a little fun in the SUV. 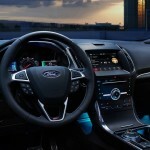 The Ford Edge ST may have a way to go on that front, but at least it’s a start. They can only go up from here.